This week is World Breastfeeding Week, and as the Salty Mama that’s still attached to a person several times a day, I figured it was my civic duty to weigh in. I’m almost 10 months into breastfeeding Izzie, and on paper I’m a Gold Star Breastfeeder. She feeds on demand and often, has never had formula and never taken a bottle (except for one weekend when she finally gave in, but that’s a story for another day). Basically I’m waiting for La Leche League to give me some sort of trophy. The community that has been built around positive breastfeeding messaging in America recently is an awesome and powerful one. Once, when Evie was nearing a year, I was sitting at the kid’s swim lesson feeding her. A Mom sat down next to me with her child and struck up a conversation. She also began to nurse her baby and we exchanged baby stats. Evie was a big healthy baby, and this woman immediately started in on how it was all due to my hearty breastmilk. Our strong bond due to our physical connection through nursing. Basically all of my child’s positive attributes existed because of the way I chose to feed her. 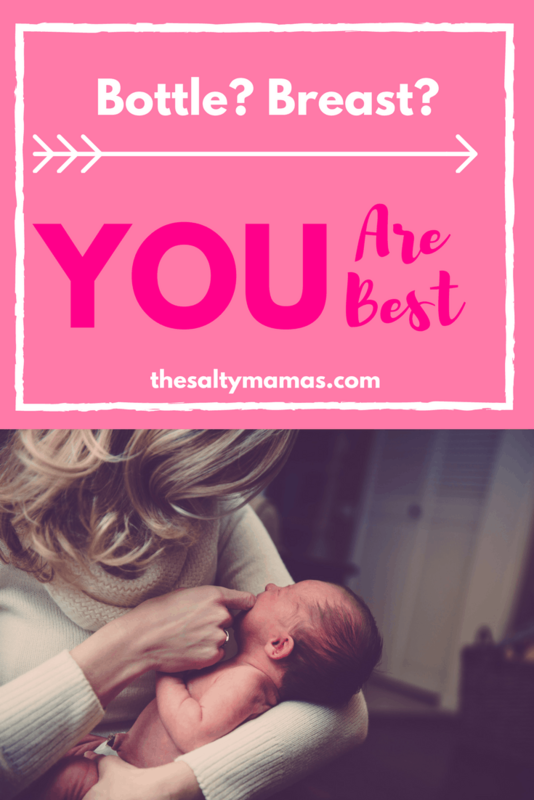 As a person currently breastfeeding a baby, those statements were a booster shot to the heart telling you you’re doing a great thing. What an ego boost! Hell yeah, my body not just created a person but is now basically making her super-human! If she gets good grades? My breast milk made her a genius. If she excels in sports? Literal Muscle Milk! I was basically raising an Olympic bound future Harvard graduate. But there’s a flip side to this messaging. One that I lived through with my son. My firstborn was almost 9 ½ pounds when he was born. And he was HUNGRY. And I tried, oh how I tried, to feed him. The first few days went well. He latched like a natural in the hospital and seemed to be happy. I left with all the confidence that I was going to do everything right. But when we got home it all went to hell. No amount of “help” actually helped. I had a lactation consultant berate me for “doing it wrong” while offering nothing constructive and better ones that told me I just had to keep trying, my milk would come in. By day 4 or 5 he was unhappy and hungry all the time, so I started pumping. For weeks, I was either trying to feed him or pumping around the clock. I spent so much time pumping and trying to make sure he had enough food that I feel like I actually missed some of his first days. I was exhausted – far beyond what I experienced with my daughters, who were by all measures “worse” sleepers and bigger criers – and felt like I couldn’t function. I watched other people feeding him the bottles that I worked so incredibly hard for. After engaging in this battle for what felt like a lifetime, but was really about eight weeks, my husband finally intervened. “This is ridiculous. I’m getting formula. You’re both miserable.” In the moment, it was a stab in the heart. I was not ready to admit defeat. But I had to admit that he was right. We were miserable. On the one hand the idea of just enjoying my baby was such an intoxicating one. I could know that he was getting enough food. I could relax and snuggle with him without him straining against me trying to eat and being devastated when it didn’t work. I could be happy. But in the not so back of my head I heard the chorus of people that aren’t just pro-breastfeeding, but anti-anything else. “Formula is poison.” “You’ll never bond with your baby.” And of course, “Breast is Best.” But I was desperate. Anything was worth a try. Four years later I so appreciate my husband stepping in and taking the reins. My son is so happy and healthy and beyond bonded to me, and if anything, formula saved us. Because breastfeeding just. Wasn’t. Working. And that’s okay. It doesn’t make me a bad Mother. It doesn’t mean I don’t want the best for my kids. It sure as hell doesn’t mean I don’t love my kids. And the people that want to insinuate that in the name of Breastfeeding Awareness need to try to take a walk in the shoes of those of us that tried and failed. Because as I roam around my Mommy-sphere of the internet, I can’t help but see over and over and over again that mantra “Breast is Best.” While this phrase may be full of empowerment to those that are breastfeeding, it can also be a soul crushing phrase to those who – for whatever reason – made the decision, or had the decision made for them, to not breastfeed. I know it was for me. So I guess what I want to contribute to Breastfeeding Awareness Week is this: Be aware of all the absolutely wonderful reasons to breastfeed. Be aware of all the reasons that some people may not be able to breastfeed. Be aware of all the completely valid reasons someone may choose to not breastfeed. And then support each other. Because at the end of the day, YOU are best for your kid. YOU are what keeps them healthy and happy and all the wonderful things we strive so hard for. Literally all of this. My experience with my son was the exact same as yours. The clarifying moment for me was when I realized I resented feeding him–I actually resented the fact that my tiny, perfect, newborn baby needed to eat. 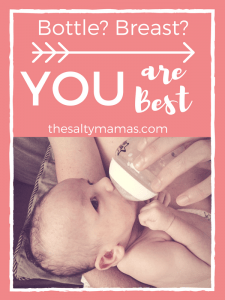 The switch to formula was emotional and stressful and guilt-inducing but in the end it was the best thing I could have done for the both of us. Thank you for writing this. I hate that you had to go through it too, but it’s always nice to hear we’re not alone. I love everything about this post! I would get so much junk from strangers when making my son a bottle using formula- little did they know he is adopted! I love how you have experienced both sides! I am pregnant with my daughter and hoping to breastfeed this time, but I’m terrified it won’t work out! It’s so good to know that either way everything will work out how it’s supposed to! Thanks you for writing this. I exclusively breastfed for 6 months while my best friend struggled with it and switched to formula. She felt guilty about it and I told her then, that’s it’s a matter of chance. Intentions to take care & feed the baby the best matters. And thank God for formula. Whatever works. Absolutely! I once said how miserable we we’re and someone commented, you should never be miserable feeding your baby. It was so simple in that moment! Thanks for sharing ? Absolutely!! And you are VERY welcome 🙂 So happy to share my experience if even one person can connect to it! Thank you so much 🙂 And yes, my partner definitely had to pull me out of my insanity spiral <3 Happy and healthy is best in my book! 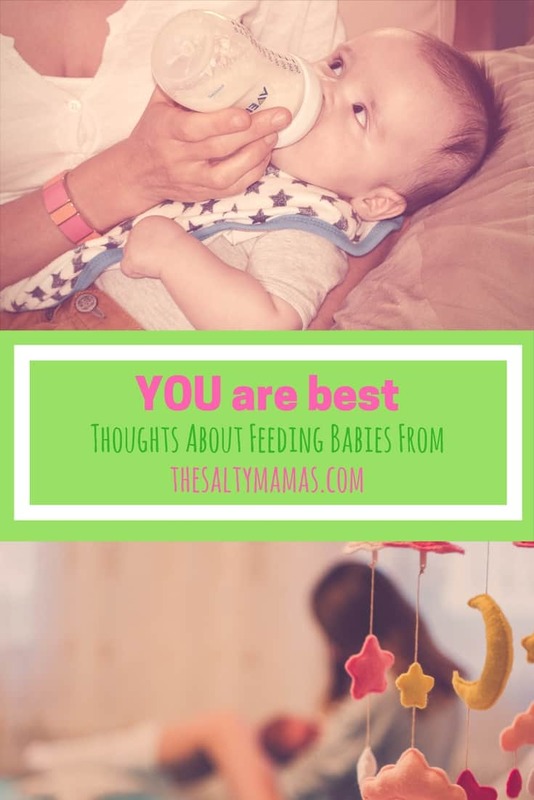 This is a great post for new mothers to read before they start their breastfeeding adventure. It might help them feel a bit more relaxed about it knowing there are challenges that everyone faces!